These well established very popular non-surgical treatments are appropriate for some patients with lower eyelid dark circles or hollows. 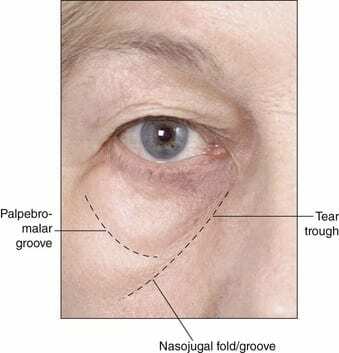 The tear trough and nasojugal is the groove at the junction between where the lower eyelid and the cheek. As we age, one of the changes which is commonly noticed and commented on is the appearance and gradual worsening of dark circles under the eyelids. This occurs due to the thinning of the overlying skin and soft tissue over the bony orbital rim. An increasingly popular treatment is the use of injectable dermal fillers, especially in patients in their late 30’s to 40’s, to essentially fill out the trough. Commonly in this age group, the loss of volume at the junction between the upper cheek and lower eyelid, i.e. a worsening tear trough deformity, is the only obvious sign of ageing. Therefore simple replacement of this lost volume without the need for surgery can lead to dramatic improvement. On the whole, the treatments are very well tolerated, being virtually painless with only a small amount of skin numbing local anaesthetic cream necessary applied to the skin just prior to injection. Patients can feel some mild pressure during the procedure itself. The whole procedure including full consultation and assessment takes 60 minutes. The recovery time is very quick and although patients do notice some mild swelling over the first postoperative week, most of this would have disappeared within 10 days. Patients may undergo a repeat course of top up re-treatment if desired to replace any filler which has slowly dissolved over time, sometimes 12-18 months later.